* Bills are sent out at the beginning of each accounting period. The accounting period for Adept TeamBeam Personal is 6 months. The accounting period for Adept TeamBeam Server is 3 months. 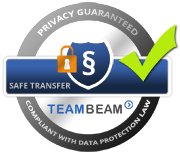 Send, receive and store large files >> Secure, familiar, simple! The cost-effective solution for individual workplaces. The standard solution for SMEs and enterprises.